JSA: Justice Be Done, James Robinson (writer), David S. Goyer (writer), Scott Benefiel (penciler), Stephen Sadowski (penciler), Derec Aucoin (penciler), Mark Propst (inker), Michael Bair (inker), DC Comics, 2000, ISBN 9781563896200, 160pp. There is a problem inherent with any piece of fiction that contains multiple protagonists, be it comics, film or novels. When you add to that the infinite array of super-powered permutations, it’s hard to believe that any superteam book can be good. Yet, superhero group books are some of the longest running comic titles, from DC’s venerable Justice League of America through all the myriad X-groups available from Marvel, as well as two titles in Marvel’s new Ultimates line. Maybe the popularity of these titles is an inherent interest in seeing collaboration in action, akin to the ensemble drama shows on TV like Law & Order, Hill St. Blues, or St. Elsewhere. A group book also promises something for everyone: you might get bored with Superman by himself, but Supes in a JLA book can be ignored if you’re a big fan of Wonder Woman. 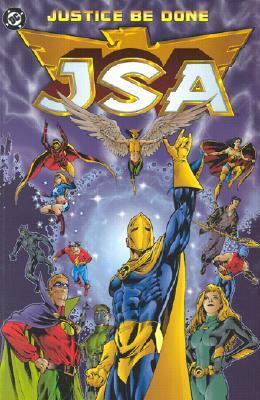 So it’s not suprising that James Robinson, fresh from his deserved success on the Starman title, tries to reinvent additional golden age DC superheroes in a new Justice Society of America (JSA). Starman, after all, had been an original JSA member, so why shouldn’t he be able to bring back the others, in both new configurations (the new Hawkgirl is a niece of the original Hawkman and Hawkgirl, wheras Sand is a former child ward of the Sandman) and old (Black Canary is here, somehow able to fit in all this action between her work with Oracle in Birds of Prey, as well as the original Flash, Jay Garrick). And if one hero had been good before, having all of these together had to be better, right? Unfortunately, what had worked in Starman, because Robinson had time in that title to remind readers of the Starman legacy, get them accustomed to Jack Knight and his quirks, and lay down some great foreshadowing of serious problems to come, is almost all-together missing in JSA: Justice Be Done or glossed over so quickly that only the most dedicated Golden Age fan can keep who all these characters are, and what they are capable of, straight. This problem is then magnified by the plot, which hinges on the predecessors of these heroes or their scion as well as a villain with a deep history, making the story fairly impenetrable for new readers and a textbook case for why both Marvel and DC are “re-envisioning” their characters, to start again without all this baggage. Everything happens quickly in this book, including the introduction of characters and universe-shattering battles, then back to quiet moments that last a single panel. In some cases, it seems that entire pages or issues are having to be condensed into a single page. I had seen some of this problem before in Starman, when Knight expanded his activities into space and Robinson lost the grounded connection of Jack with his antique store in favor of a Starlin-esque psychotropic jaunt. Here, the stakes for the characters rise too quickly, from attempting to rescue a single child to an apocalytic fight at the end of time, that the reader isn’t able to see a sense of scale. It is like a big-budget Hollywood action thriller, where what is important is not the characters, but the spectacle. In the end, instead of an ensemble, the JSA is only a collection of explosions, like fireworks that burst upon the page and are then gone, as this book is from your memory.